John Andrew Macphail was born in Orwell, Prince Edward Island, and received his medical degree at McGill in 1891. He became McGill University's first Professor of the History of Medicine in 1907 and occupied the Chair for thirty years. During World War I, he was an officer in the 6th Field Ambulance with the Canadian Army Medical Corps. In 1918, his war work was rewarded by a knighthood. Given by Macphail to the old Medical Library of McGill University in 1921. Transferred 1948 from the Medical Library to the Osler Library. Old accession number 255. 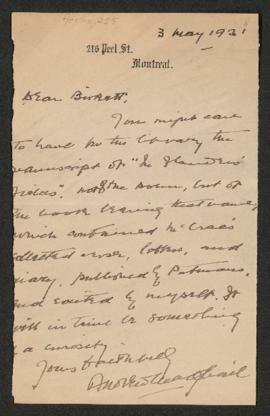 McCrae letter and manuscript previously owned by Mrs. Carleton Noyes, class of 1904, R.V.H. Gift of May Metcalfe. 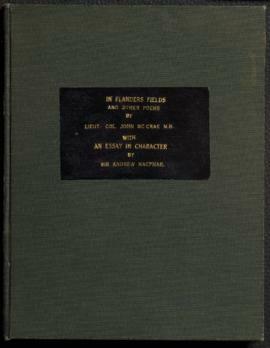 Fonds documents a portion of the literary activities of Sir Andrew Macphail with the typescript of In Flanders Fields and Other Poems by Lieut.-Col. John McCrae M.D. with the Essay in Character by Sir Andrew Macphail, originally published in 1919. The typescript is accompanied by a signed letter from Macphail. The fonds also contains a letter from John McCrae while on active duty in France to Carleton Noyes, Cambridge, MA, with an envelope postmarked 31 May 1916. 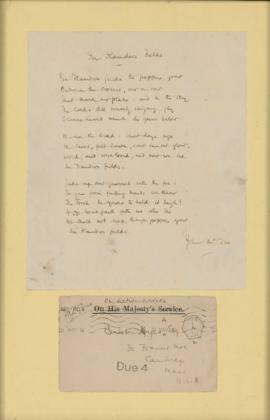 Enclosed with the letter is an autographed signed copy of McCrae's poem, In Flanders Fields.